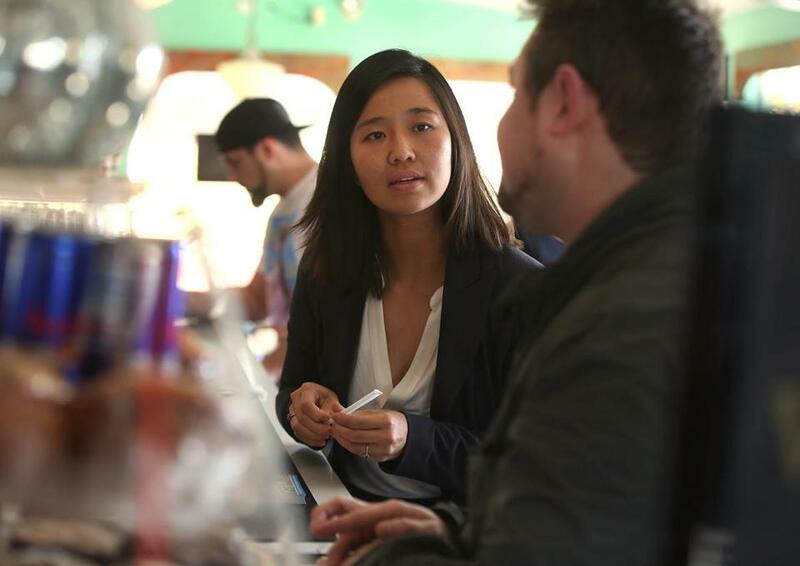 City councilors Michelle Wu (pictured) and Matt O’Malley pressed the Walsh administration to join the aggregation bandwagon in 2017. The city of Boston has proven to be an elusive grand prize among electricity brokers, but a Marlborough firm finally won the jackpot. Officials in Mayor Martin J. Walsh’s administration just picked Colonial Power Group to coordinate a massive electricity purchase on behalf of some 190,000 residential accounts and up to 31,000 business accounts across the city. About 150 cities and towns in Massachusetts beat Boston to this point, as part of a trend known as community choice aggregation that involves switching the vast majority of a particular municipality’s accounts away from the incumbent utility’s suppliers. (Eversource and National Grid still deliver the electricity and bill the customers.) The primary motivator: the desire to pick a greener option to combat climate change on a local level. City councilors Michelle Wu and Matt O’Malley pressed the Walsh administration to join the aggregation bandwagon in 2017. But Walsh’s then-energy chief had some concerns about the potential for extra costs. Environmental groups went as far as trying to publicly shame Walsh last June, when he hosted the US Conference of Mayors here. By the fall, though, Walsh’s crew was moving full speed ahead. Community aggregation is now seen in City Hall as a vital part of making Boston carbon-neutral by 2050. State law already requires that utilities buy a certain amount of power from renewable sources, an amount that rises every year. This year’s floor: 14 percent of a utility’s total power load. Meanwhile, these municipal contracts typically enroll residents in a plan with a higher percentage of green electricity than the state minimum. Like in other communities, Boston residents will need to proactively opt out if they don’t want to participate. In many places, consumers also have the ability to “opt up” into an even more environmentally friendly plan. This approach has raised concerns that many consumers or businesses could get swept up into an aggregation plan unknowingly. Advocates say the economics of bulk purchasing would fall apart if these aggregation programs were structured as “opt-in” contracts instead. Some green-power contracts end up being more expensive than the incumbent utility, but it’s usually not by much. The ink is barely dry on the two-year Colonial contract, so it’s too early to know how this will play out in Boston. City officials still need to design the program. The broker will get a tiny percentage of the total power purchase as payment. City officials estimate that extra cost will total $1.15 million in a year, equal to maybe another quarter or two on a homeowner’s monthly bill. Any green premium would be an additional cost. But environmental groups say Newton’s new default option, with 60 percent of power from green sources, is beating Eversource. They remain optimistic that savings can be found in Boston, too. To Colonial president Mark Cappadona, the size of Boston’s contract represents an unusual opportunity — and not just a money-making one for his firm. Boston could use some or all of its purchasing power to sign contracts directly with solar or wind farm developers. Worcester just embarked on its own program. But Springfield, the state’s third-largest city, hasn’t yet joined the crowd. Cappadona says he hopes Boston’s participation will encourage Springfield and other holdouts — and possibly come up with a new model for wielding this kind of power in the future.